This Mother’s Day, my daughter surprised me with this special gift: an article to post on my blog. Thank you, sweetie. It was a broken record, as only a mom can perform. So predictable and repetitive that even though I heard it coming, I was still surprised and annoyed. “Oh we can make that,” my mother would say. In response to every purse I wanted to buy, every beautiful, leather bound journal I tried to bring home, even pairs of jeans that had been pre-distressed or patched for an additional 35 dollars. It seemed like everything I wanted, my mother believed she could make herself – or, worse, that we could make together. It drove me insane. That’s not what I wanted. I wanted something new. I wanted something other people had. I wanted it the way it had been made in factories and shown to me on TV. I didn’t want to make it – it was already made. But then when I was 12 years old, I got cast as Marian the Librarian in the Music Man. It was a lead role. I was over the moon. But I needed a costume befitting of a librarian in 1920s Iowa, and most costume shops stocking outfits of that kind couldn’t accommodate a not-so-slightly overweight 7th grader. We went to three stores. I cried in the dressing rooms of them all. Finally, instead of a fourth costume or thrift shop, my mom pulled into JOANN’s. “This will be better,” she said. “Go pick out a fabric you want, then we’ll look at patterns and find one that fits the show. This is what real actors do anyway,” she said, “they have someone make their costumes for them.” I showed her a high-waisted skirt outfit in a deep navy blue. “We can make that,” she said. Every day when I came home from rehearsal, she was in her studio making the dress I’d spent days crying and searching for. And in the end, everything was perfect. I had even sewn a bit of the hem. The first week of my freshman year of college, my mom sent me an email. It was clear that she was afraid that being half a continent away, I would not find a customized, right-sized source of all the things she had been doling out for 18 years: guidance, encouragement, snarky cautionary tales . . . and love. So she made it for me. 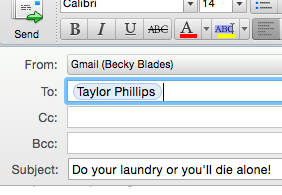 With the subject line “Do your laundry or you’ll die alone,” the off-to-college letter had 172 line items of advice – loving advice, funny advice, essential advice – all the advice my mom would have given if she’d thought I was listening. But then, 1400 miles away, on my iPhone (which she’ll be scandalized to know I was reading at the dinner table) I was all ears. I wrote her a letter back. I told her she’d made an incredible thing. And I lamented that my needy self was off in Massachusetts where I couldn’t ask her to sew anything . . . and that my overpriced coffee addiction was my own problem. I told her this list was funny and uplifting and book-worthy – that publishers would absolutely want it. And I challenged her to make it in time for my younger sister’s high school graduation two years later. Publishers didn’t bite. But my mom made it anyway. Cover design, art work, illustrations, type design and all. She self-published, but with a flourish and attention to quality that set her book apart from other self-published books. Four years after that first e-mailed letter, I was home in Kansas City, a college graduate preparing to move to New York for my first real job. I had seen a sketch comedy show a summer before, and my sister and I decided to make one ourselves to produce in our hometown. My family was sitting on the patio of our favorite coffee shop going over show bits and discussing the KC Royals chances in the 2016 Playoffs when my mom got an email. It was a publisher. Now almost a year later, the second edition of her book has just come out from a mainstream publisher – with a silky hardcover and an intro that refers to me as a “young professional” instead of a “college student.” It’s the new, legit, fancy version. It came with an advance and a royalties contract and agent negotiations and a barcode that includes the Canadian dollar amount. It is something new, something other people will have, something made in factories, and something that will be seen on TV. And just last week, while sitting in that same coffee shop, my mom got another e-mail – from Oprah’s Book Club! This week, Oprah.com sent an e-blast to millions of subscribers with the following subject line: “Advice You’ll Wish You’d Gotten Earlier in Life.” In the article, Oprah’s Book Club listed 13 pieces of my mom’s book, and told everyone to buy the book. Not bad for a do-it-yourself author. I’m so glad that moms all across the country will be buying this book for their daughters and giving them the chance to read my mom’s wonderful, witty advice. But there will also be moms who take one look at the cover, put the book down, and head straight over to the craft store to get teal construction paper and instructions on horizontal vs. vertical binding strategies. Those daughters are lucky, too. 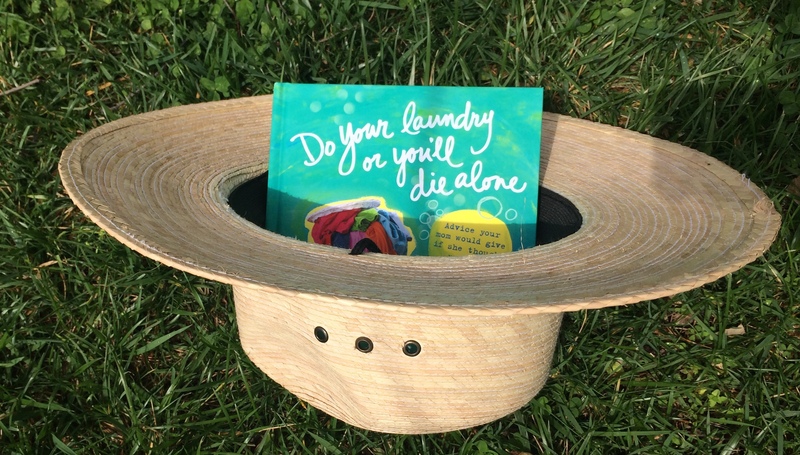 Take a peek at the book my mom made: Do Your Laundry or You’ll Die Alone. 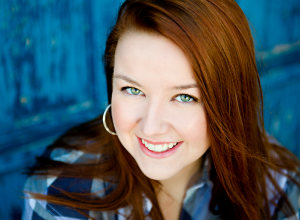 Taylor Kay Phillips is a writer and comedian in New York City. She does everything her mom tells her to, but usually five years late.